The recipient of the Friend of the Seminary award is nominated by the faculty or Board of Regents for making a significant contribution to the well-being of the seminary. 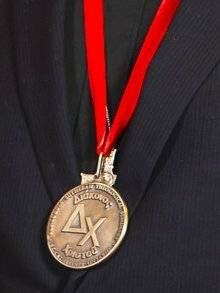 The Delta Chi Medal, by contrast, is awarded by the seminary on behalf of the wider church. This “highest and most distinguished award” is “presented to an individual, either clergy or lay, whose life exemplifies service to Christ in his/her everyday living and vocation.” In nominating, one should consider the person’s service to the local congregation, the community, the synodical district, the church at large, church service organisations, and educational institutions. Delta Chi refers to the initials of the Greek expression διάκονος χριστοῦ “servant of Christ”. Anyone in LCC may nominate a candidate for the Delta Chi award. No current faculty or board member is eligible. Please submit your nomination in writing to the seminary or via e-mail to concordia@brocku.ca. The deadline for nominations is 10 January 2019.